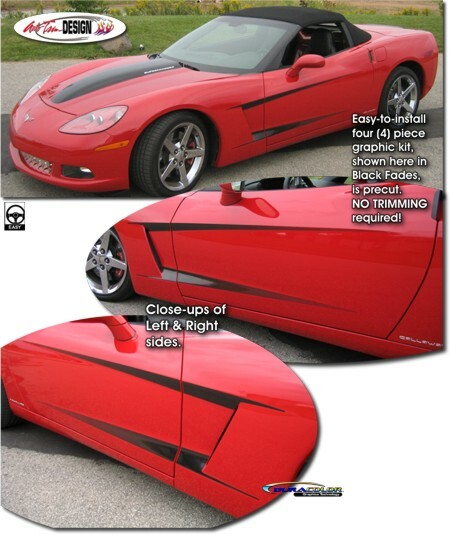 Add a unique look to your '05-'13 Chevrolet Corvette C6 Coupe, Convertible, Grand Sport or Z06! The four (4) piece body side graphic kit is precut and designed to fit perfectly along the C6's distinct side body lines as shown. NO TRIMMING required! Starting as solid at the front vent, the graphics gently fade to rear. Available in four (4) fades colors, graphic pieces are covered with a 2.5 mil clear laminate which will protect the graphics from miles of abuse.